*New* boy's medium gray slim-cut suit from Fouger. This suit is a handsome choice for ring bearers, wedding attendants, or special occasions. It is also an ideal semi-formal wear choice and can be worn with or without the suit coat. 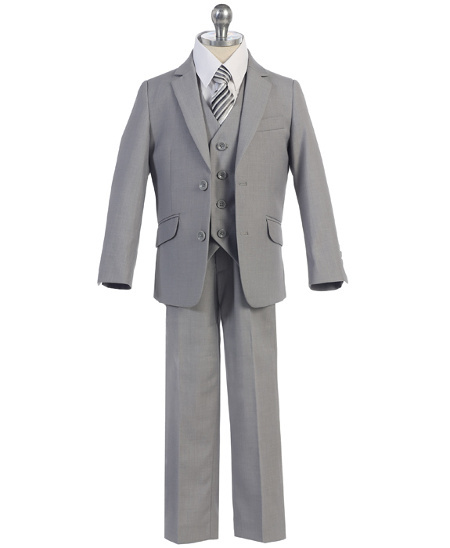 This 5- piece boy's suit includes suit coat, vest, shirt, pants, and a tie in a beautiful gray diagonal stripe. The fabric is 65% polyester and 35% viscose which is ideal for boys to stay wrinkle-free. The white dress shirt, which is part of the set, is a cotton poly blend. Sizes 2 - 8. Runs true to size. Imported. NOTE: These suits are a special order item so allow time for delivery. Please call (831-704-7327) or email us is your size is not available in the drop down.